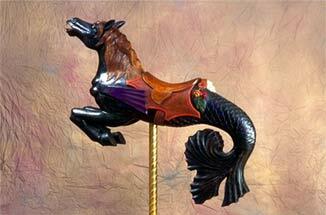 The hippocampus, which combines the head and forequarters of a horse and tail of a dolphin was a popular mythical creature included on most of the PTC (Philadelphia Tobagan Company) menagerie carousels from 1907-1912. It was surprising to find angels and cherubs such as the plump character riding on the back of this hippocampus as decoration. This giant cat dominates the animal kingdom with his powerful physical strength. 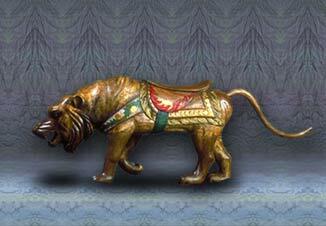 Concentration emphasizes power in the tiger with the crouching position and raised left claw, hence the name "Sneaky Tiger".The flames carved on the side of the saddle signifies the fire element which is associated with the sneaky tiger.A must have for all feline lovers and martial arts enthusiasts. This mythological creature has a larger than life personality with the head, beak, and wings of an eagle, the body of a lion ,and the tail of a serpent. 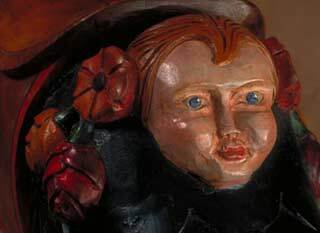 Traditionally placed around buildings and churchyards to ward off evil spirits. 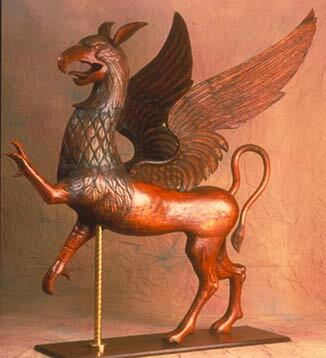 Our Griffins have been known for protecting home and office environments.